A few weeks after I bought my mint condition Nikon E2N (April 2005), I decided to get another of the early digital models. 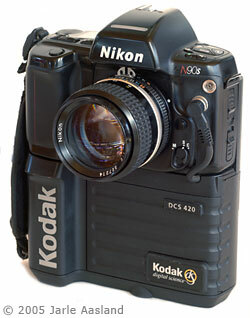 The 1.5 megapixel (1524 x 1012 pixels) Kodak DCS420 was announced in 1994, and was built around a Nikon N90 camera body. The camera arrived safely about a week after my eBay purchase. I paid $152 for a nice, fully-functional body, and an additional $40 for an original Elpac charger. The body has a few scratches, but still looks very pretty (see photos). In 1994 the camera cost about $12000. Rewarded are those who wait. As with the E2N, I don't really plan to use this camera. Guess that makes me a collector, even if I truly believe that good cameras should be used, not "collected". I've now tested the DCS420 for a few days and made some early observations. As mentioned elsewhere on this site, I will not repeat lots of information easily found elsewhere. This is not a comprehensive review, and it's certainly not scientific in any way, shape or form. As always, don't take it too seriously. Being the third camera I've bought in less than a month (I'm very happy to have a understanding and supporting wife, but I'm probably stretching my luck now), it's only natural for me to compare the DCS420 with my new 12.4 megapixel D2X (you're kidding, right?) and 1.3 megapixel 1996 Nikon E2N. If you've ever seen an early digital Nikon camera (or read my E2N review) you know that these things are big and bulky, resembling medium format film bodies. One (if not the only) reason for their size was that Nikon decided to incorporate a "Reduction Optical System" into the body. Working like a "reverse teleconverter", lenses on the E-series Nikon cameras have the same field of view as they would on a regular 35mm film body. There's no crop factor. The Kodak, on the other hand, is a completely different story. Using a standard Nikon camera body, there's a huge 2.6x crop factor. It may not sound like a lot more than the 1.5x factor in modern Nikon DSLR's (like the D70 or D2-series), but it is. A 20mm wide angle will suddenly behave like a 52mm (on a film body), and a 300mm will give you the same field of view as a 780mm! Needless to say, you will have a hard time finding a real wide angle lens for this camera. The standard Nikon viewfinder will show you the entire picture (again, it is a 35mm film body), but a thick black frame will indicate the actual crop recorded. It's actually a very nice solution, similar to the high speed crop (HSC) mode in the D2X. 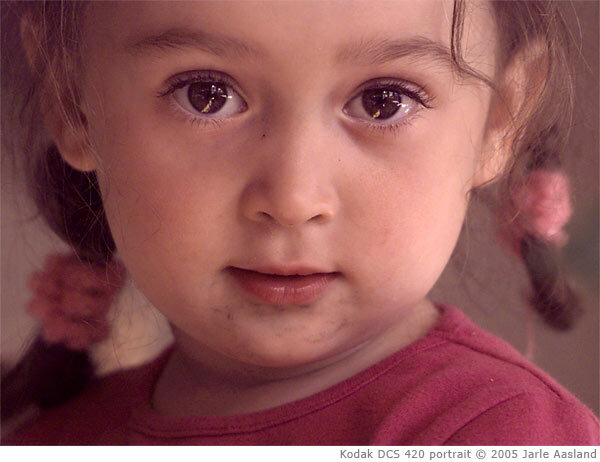 Much better than the masked, tunnel-like viewfinder found in many modern cameras, like the D70. Thinking about it, Nikon should do the same with all their digital SLR's. 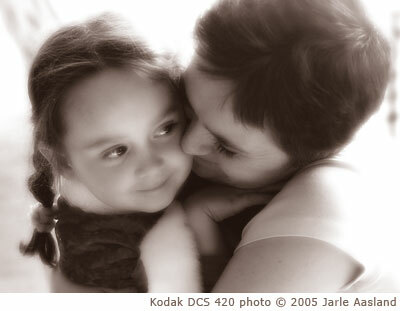 Let the photographer see as much action as possible, without removing the eye from the viewfinder. A darker, greyed-out area (outside the frame) would be perfect. There are three different models of the DCS 420. I have a 420c, indicating a color CCD (there are also monochrome and IR models). The camera uses a PCMCIA-ATA type III memory card, meaning that I can use the 40 MB card that came with my E2N. Instead of messing around with troublesome SCSI drivers and a cable, I can simply insert the card into the PCMCIA slot on my laptop. The Kodak DCS 420c will only record 1610 kilobyte TIFF files (that cannot be read by Photoshop without a special Kodak plug-in that can be downloaded for free). The two year newer Nikon 2EN will also record JPEG's. Unlike the E2N and later cameras, there's no white balance setting. 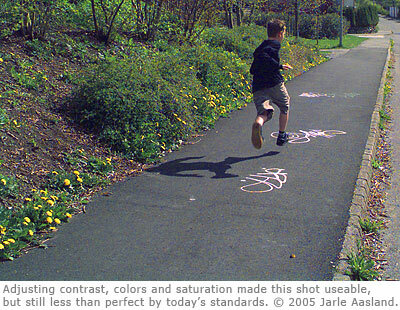 All color adjustments must be done using filters or in post-processing, similar to shooting regular film. Also, there's no LCD monitor, so you're shooting in the dark, so to speak. One of the biggest joys of film-based photography has always been to examine the newly developed film. The early digital models will give you the same exciting feeling when viewing the photos on the computer monitor for the very first time! 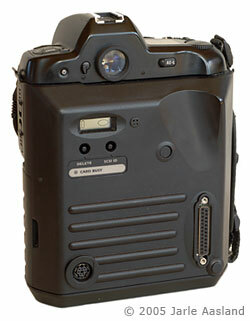 Using a regular Nikon film body, the DCS 420 can handle both autofocus and older manual focus lenses. Unlike the E2N, there's even a small buffer, enabling you to capture five shots in just over two seconds. Impressive. Battery life in my particular unit seems to be very good, considering the age and technology involved. Apparently, a good, fully charged battery should last approx. 1000 (!) frames. I wouldn't bet on it, but still. Despite these issues, it's easy to understand why most professional photographers at the time preferred the digital Kodak cameras over the cumbersome Nikon/Fujifilm bodies. Unlike the E2N, my DCS420 feels and operates like a "real" 35mm camera. Sure, it's also big, but it doesn't really feel that way. At least not compared to the E2N. Nobody has been able to tell me how many Nikon E-series cameras were sold, but according to Nikon UK, "we are talking within the low hundreds across Europe". Here in Norway, the local Nikon distributor didn't sell any Nikon E-cameras at all. Instead, they sold plenty of digital Kodaks (both Nikon and Canon based models). 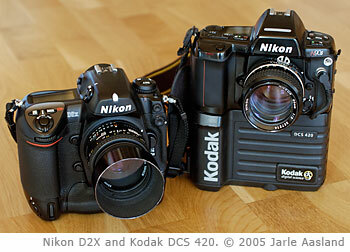 If I had to choose one of these cameras (Kodak DCS 420 vs. Nikon E2N) for serious work, there's little doubt I'd bring the Kodak (for most jobs). Still, I'm glad I don't have to use any of them. Needless to say, I prefer my D2X. There's no arguing that Kodak was on top of the digital world when the early DCS cameras were produced. Unfortunately, not having their own SLR bodies and lenses, it became increasingly difficult to compete with Nikon and Canon once the Japanese photo giants decided to produce their own digital cameras. Obviously, the DCS 420 cannot compete with later DSLR models, but I'm still impressed. This professional 1994 camera produces images just as good (or perhaps even better) than my 1999 Coolpix 800. Except for one thing: White balance and colors are better on the Coolpix. Image sharpness and camera operation (obviously) is much better on the Kodak. After all, it is a real 35mm body with high-quality Nikkor lenses. To sum it up, I think the DCS 420 is well worth the $150 I paid for it, even if it will be collecting dust most of the time. Remember, I didn't simply buy a camera - I bought a piece of digital photography history. Makes all the difference in the world. Since many eBay sellers frequently link to these pages when auctioning old cameras, I'll add the following advice: If you're considering the DCS 420 for real world use: Forget about it. Don't be fooled by the original price tag. This was cutting edge technology in the mid-1990's, but not any more. Do yourself a favour and buy a modern camera instead. On the other hand, if you're a photography/technology nerd/collector this is a cool camera to play with. Find a cheap one and have fun! See also Eamon Hickey's great article on the NC2000, another Kodak body from this period, and the excellent articles at the Photography in Malaysia web site.